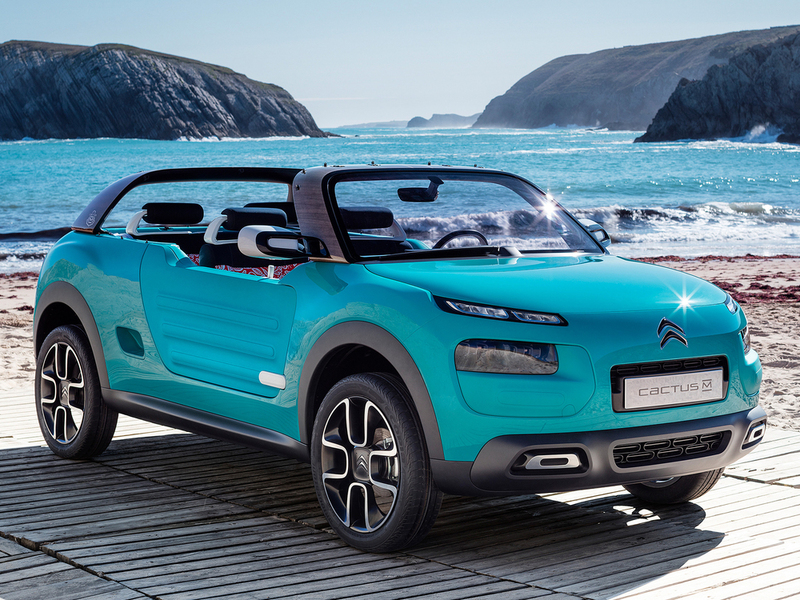 Citroen has unveiled a new concept car - the Cactus M - which set to premiere at the Frankfurt Motor Show. Inspired by the Citroen Mehari, first seen in the late 60s, and its 'go-anywhere' styling, the new concept boasts a 'bright, upbeat personality' says the French manufacturer, and 'places leisure at the heart of the automotive experience at ease on all types of terrain and in all situations'. With clear family ties to the Citroen Aircross concept that was presented at the Shanghai Motor Show in April, the wings are sculpted around the wheel arches for a more compact, muscular look. The upright windscreen, raised body and large wheels underline its 'go-anywhere' ability. Powered by the PureTech 110 petrol engine with start/stop, the concept offers fuel consumption of 58.9mpg and returns CO2 emissions of 110g/km. Along the sides, the large plastic doors add a lightweight, protective touch, giving the vehicle its signature look. This design brings to mind the Mehari, a vehicle created with the same philosophy. The cabin is completely open, connecting the occupants to their surrounding environment. Passengers access the seats in row two by climbing over the sides of the car, using the built in steps on either side at the rear. Citroen has focused the concept's design on turning 'leisure into a lifestyle', and places fun at the heart of the automotive experience. The interior illustrates this approach, using materials inspired by open-air activities. The cabin can even be hosed down thanks to the drainage outlets integrated in the foot wells. Inspired by the world of surfing, the seats resemble wetsuits and are upholstered in a brightly coloured neoprene waterproof fabric. 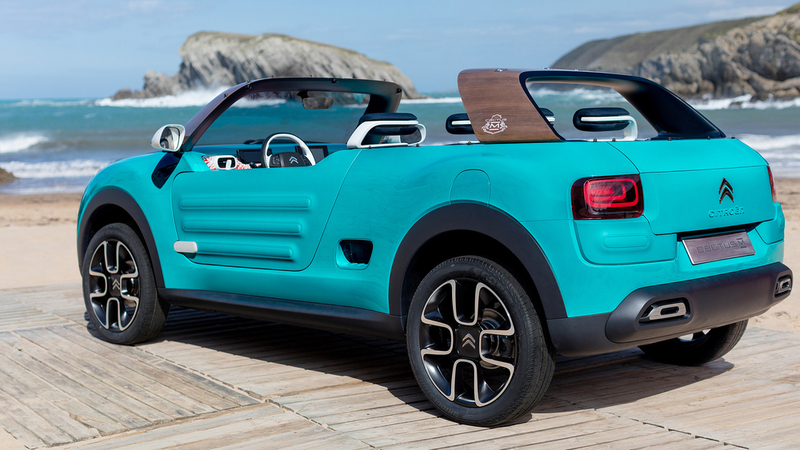 The Citroen Cactus M is a modular vehicle, with a rear arch that enables passengers to carry all their equipment, such as wakeboards or surfboards. Everything is designed for comfort, ease of use and peace of mind. Whatever the activity, weather or road conditions, Citroen says everything on the concept is designed to ensure a relaxing ride for the occupants. On all types of terrain, the Grip Control function optimises traction for a 'assured ride anywhere'. The Cactus M also features a modular cabin that turns into a 'couchette' and a roof that can be made into a tent. The inflatable roof features an operating mechanism and provides welcome protection in the event of rain. The car also features on-board technologies for everyday use with equipment borrowed from the C4 Cactus, including the central Touch Drive interface and the Easy Push gearbox system. 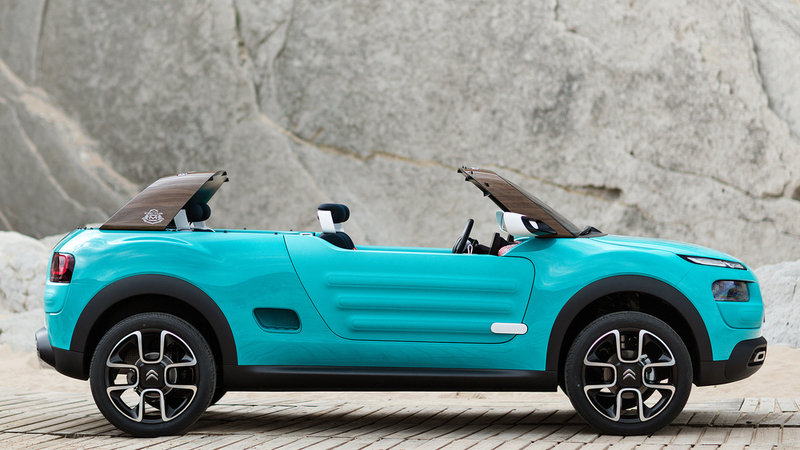 The Citroen Cactus M concept will be revealed at the Frankfurt International Motor Show which opens to the public from 17 - 27 September.